Anybody who’s been to the North Lake Tahoe town of Truckee knows that Moody’s Bistro & Lounge is an institution, known both for its jazz and for its food, with its emphasis on seasonal, locally sourced ingredients. This summer, Moody’s will again take diners to the root (as it were) of those ingredients with its third annual “Dinner in the Barn” series. For this, Moody’s executive chef and co-owner, Mark Estee, has partnered with Gary Romano of Sierra Valley Farms, a certified organic farm and native plant nursery on the Feather River near Sierraville, to provide four-course meals in the farm's 1936-era barn (built by Romano’s uncles) over eight evenings this summer: June 19-20, July 24-25, August 28-29 and September 4-5. Each meal will be put together by Chef Estee and Moody’s Chef de Cuisine Guy Frenette using fresh organic vegetables that are picked that day and paired with appropriate wines and live music. Before dinner, guests are encouraged to tour the farm. Romano will talk about how the vegetables are picked and then Estee will talk about how they were prepared -- in other words, it's about as farm-to-table (or, as Romano calls it, farm-to-fork) as you can get. Cost for each “Dinner in the Barn” event, which is limited to 60 people, is $125 per person. 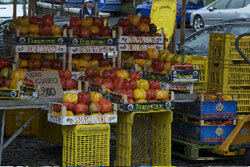 This includes the four-course dinner, wine, beverages, farm tour, tax and tip. 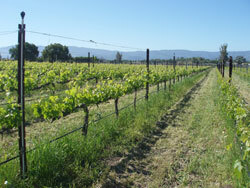 Transportation to and from the farm dinner will be available through Truckee Tahoe Transportation. For reservations to “Dinner in the Barn,” call Moody’s at (530) 587-8688 or for more information on "Dinner in the Barn" (or the summer cooking classes) visit MoodysBistro.com. As a fan of GardenstoTables, I keep an eye out for gardens during my travels. Mii amo, a destination spa at Enchantment, did not disappoint. 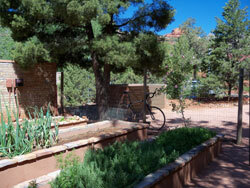 Though the red rocks of Sedona hinted at dry heat, the area was lush with vegetation. Tucked away by the side of the spa was a pathway that led to an intimate, fenced-in garden with 60’ x 25’ dimensions. Propped up against the fence was the bicycle of Doug Copp, the local, organic gardener who lends his services to Mii amo’s herb-and-vegetable garden. Copp was more than happy to give a tour of the garden, which was making the transition from winter to summer plants. He escorted me through the raised beds with their irrigation system. “Mii amo was looking for a more sustainable way to raise food,” Copp says, “so they started the garden in 2008.” Organic composting and a worm garden of little red wigglers was also part of the venture. “Mii amo believes in garden to table, then back to the garden,” Copp says of the philosophy behind the compost. The irony is that Los Olivos is located within an incredibly rich agricultural region and truly seems to understand the importance of its local growers. The Los Olivos Café even lists the local farmers whose produce is featured on that day’s menu, and the owners, Sam and Shawnda Marmorstein, own and run the organic Bernat Vineyards & Winery (pictured, above). The 10-acre Bernat property will be the site for an event on June 19 that doesn’t just celebrate local farmers, chefs and winemakers but brings guests to where it all begins: the land itself. With a table set between Bernat’s organic vineyards and the organic farm run by Shu Takikawa, “Seed, Sow, Supper” will serve produce gathered that morning and prepared with locally grown grass-fed beef and chicken and topped off with local wines. For more information on the event, which will benefit the Santa Ynez Valley Jewish Community, visit www.syvjc.org or call (805) 693-4243. Those who can’t make the dinner – or who just want to take their wine-country experience a step closer to the actual grapes – can stay at Bernat’s new Vineyard Retreat (pictured, right), a one-bedroom guesthouse on the Bernat property with a quiet atmosphere, a view of vines and an array of animals (three horses, two dogs and a very friendly cat) to greet you. 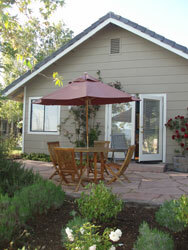 Included in the stay is a bottle of Bernat wine and a $10 coupon to the Los Olivos Café.